Cars Boarding Ferry Boat, Ocracoke 1955. 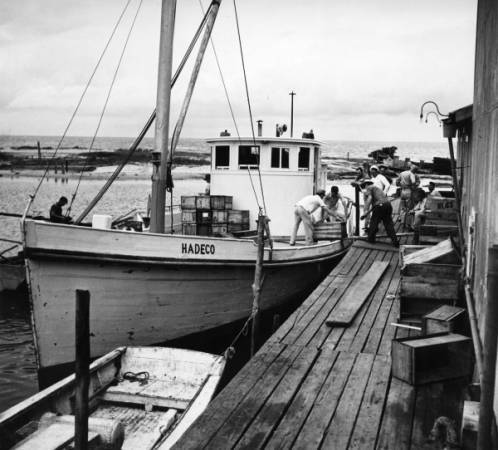 Frazier Peele of Hatteras ran the Hadeco across Pamlico Sound, carrying fish to Engelhard in Hyde County where it was packed onto trucks and delivered to markets around the state. Engelhard was, in 1936, home to a new ice plant, the Pamlico Ice & Light Company, that billed itself as “Headquarters for Stumpy Point and Hatteras fishermen” in advertisements in the Dare County Times newspaper. The 55-foot Hadeco was built in 1932 in Bettie, NC. The boat’s name stood for the Hatteras Development Company, the power and ice plant operated by Peele in Hatteras village. A Standard Oil photographer working on the island in 1945 labeled the plant the “One Man Utility Company” in descriptions of his photographs. The impetus for generating electrical power in coastal villages like Hatteras and Engelhard was the need for ice to keep fresh seafood cold so it could be shipped and trucked to distant markets and distributors. The Hadeco also carried freight, passengers and vehicles. The boat left Hatteras in the morning and returned in late afternoon. Frazier Peele also carried freight to Engelhard on the H.C. Drewer, a converted menhaden boat. The Hadeco was being towed to Norfolk for repairs around 1950 when disaster struck in Pamlico Sound. “Going up the sound we ran into a storm and it started getting bad onto us and we had to turn her loose. She went up onto the reef and broke up,” Willis said. In 1950, Peele started the first ferry service between Hatteras and Ocracoke. Up until then, travelers usually caught the Aleta in Atlantic, NC to get to Ocracoke. “His ferry was simply a shad boat on which he nailed wide planks to form a platform for one car,” explained Philip Howard of Ocracoke. After the first year, Peele built a more conventional ferry that could hold three or four cars. In 1957, the state bought Peele’s ferry and established free service between Hatteras and Ocracoke. Howard, Philip. “From Philadelphia to Ocracoke, 1951.” Village Craftsmen, 21 April 2014. Swain, Buddy. “Going to Grandmom’s House Crossing Pamlico Sound.” Island Free Press, 18 Jan. 2008. Winslow, Darlene and Inez Tolson. “The Old Hadeco: Harmon Willis describes his work with Mr. Frazier Peele.” Sea Chest vol. 5 number 1 (1978).